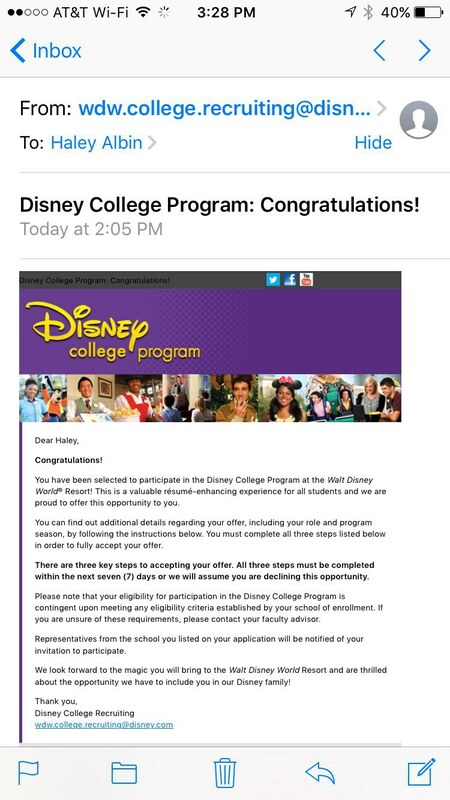 The Most Magical Moment Ever: I Accepted An Offer From The Disney College Program! Walt Disney World, here I come! It was any other normal Friday with absolutely nothing to do. Slept in late, stayed in my pajamas until God knows how long, and playing with my pet cat every time I got bored with what I was doing. Yup, just a normal day-off in my quiet post-grad life...or so I thought it was. I was casually streaming "Cupcake Wars" on Netflix admiring the beauty and master skills of baking, until I heard the notification sound from my email. I thought to myself, along with a sigh, "It's probably just another subscription email from the usual stores I shop at or another Starbucks Rewards email." But no, no it wasn't...it was even better than that! My eyes widened, my breath was hitched. I cupped my hand to my widely opened mouth and all I could say was, "OH MY GOD." Then, the waterworks came in and so did the furious shaking. I thought I would hear from Mickey Mouse by late October! I guess he knew how much I wanted to hear this news so badly, and he decided to make my mundane weekend better than I expected. So kudos to The Walt Disney Company for getting back to me As for my offered role, I got Attractions! I was offered one of the most competitive roles in the program, and it was absolutely bonkers to see in my acceptance letter I was going to be an Attractions cast member! I put Attractions as number three in my top roles list due to the popularity of the role. But wow... Oh. My. GOSH!!! Nonetheless, wherever I get put, it's going to be one of the most rewarding experiences of my life. I feel absolutely proud of myself for taking this chance on such short notice because this truly does feel magical beyond belief! Mr. Disney, Mickey Mouse, thank you so SO much for believing in me! This is an absolute blessing, and I can't wait to come down to Florida to help create the magic with the rest of the company! !